On some of the tables at our annual Birthday Party, taking place on Friday 9th February and sponsored by Express Solicitors, we will have a few replicas of Houldsworth Mill. These have been lovingly handcrafted by Alfred Chow, who we met as a result of our recent community building work in Eccles. Forever Manchester has recently started working in and around the Patricroft area of Eccles. Our Community Building team have been out and about meeting people who live there and finding out what happens in the area. Discovering strengths is an essential and ongoing part of Community Building and ABCD methodology. There’s potential to discover skills and assets in every corner of every community, and Lisa’s been finding plenty in Eccles. There are hundreds and thousands of gems everywhere, but occasionally extra special diamonds are uncovered that we work with in completely unexpected ways! Lisa discovered one such diamond on a visit to the Tindall Street Allotments in June: local resident Alfred and his wife Sue. 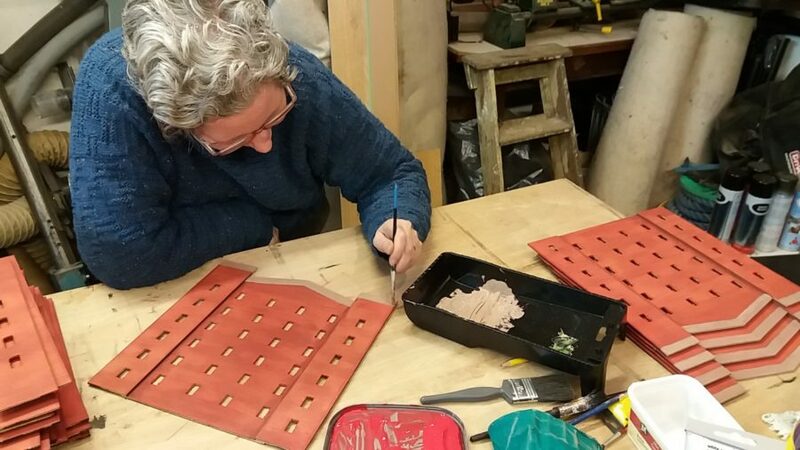 Alfred and Sue had been helping residents make a bench at the Incredible Edible Salford shed and Lisa quickly discovered that Alfred was a man of many talents. Much of Alfred’s ability stems from having a diverse background of skills and experience that he has brought together to solve design and construction problems. He believes that having Asperger’s has allowed him to see the world around him differently so he can see solutions quickly and can find ways to achieve them using the limited tools and equipment that is available at the time. He works mostly in wood, metal, fabrics and reused scrap from his two small workshops. The main areas of his work are with community groups, arts projects, museums and CICs. In his recent blog post he outlines how he crafted the mills, from brief to finished article! Read the rest of Alfred’s story, and see the completed mills, here. Alfred and Sue are now joining us as our special guests at the Birthday Party where they will have the opportunity to be introduced to and connected with further potential business interests from across Greater Manchester, and we’re really looking forward to connecting Alfred and Sue even more to the Eccles and Greater Manchester community.